Batch 1.7 introduces Mobile Landings. Mobile Landings allow you to easily introduce continuity between your app, and your pushes: A user opening a push will be greeted by a rich message related to what they opened, rather than just ending up on your app's main menu. They're included in the Startup, Business and Enterprise plans. 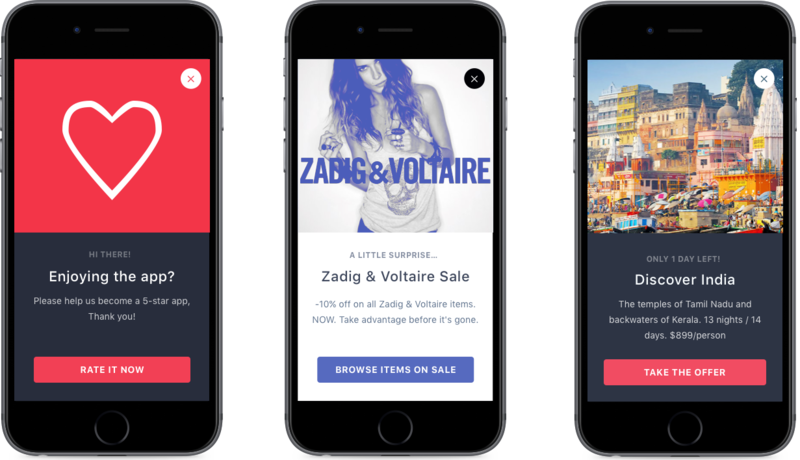 There's no code required to make mobile landings work in automatic mode: just attach a landing to your push campaign, and Batch will display it. You might want to go further into this documentation, and setup your delegate, or head to the Custom Actions documentation to add custom behaviour to buttons. You may want to be in control of if, when and how landings will be loaded and displayed. Batch allows you to disable automatic displaying, and handle loading and displaying the view controller itself. // its own window, to allow user interaction around the message if needed. Banners require this, for example. Controlling the display using "Do Not Disturb mode"
Batch 1.10 adds a "Do Not Disturb" (DnD) feature: It allows you to tell Batch to hold on a mobile landing for you, rather than display it without using the fully manual mode. For example, if launching your app results in a splash screen or a fullscreen ad, you might find it undesirable to have Batch display something on top of it. Turning on "Do Not Disturb" mode will make Batch enqueue the latest mobile landing, rather than display it. Once you want to start showing landings automatically, call the method with false to turn it off. BatchMessaging.hasPendingMessage , allowing you to peek into the queue. BatchMessaging.popPendingMessage() , allowing you to fetch the pending message (if any). Since calling this makes Batch delete its reference to it to save memory, further calls might return nil. BatchMessaging.showPendingMessage() , allowing you to try to show the pending message, if any. Note: Only the latest message is queued: if a mobile landing arrives while one is still pending, it will overwrite the previous one. It can be any object that implements the BatchMessagingDelegate protocol. While your application delegate can safely implement this protocol, we split it out in a separate class in our examples for simplicity. The messageIdentifier variable is the message tracking identifier you've configured in the dashboard. It can be nil if you didn't specify one. The size will be overriden later, so you can use anything you want. Make sure you provide both a normal and a bold font, even if they are the same. This assumes you've already got custom UIFonts working. If you didn't, you can find a great tutorial here. An error occured while making a NSURL for the following link: '<your deeplink>', ignoring deeplink action. Deeplinks on iOS are automatically called by the SDK using sharedApplication's openURL method. Since it needs a NSURL instance, the deeplink string needs to be a valid URL accepted by iOS' NSURL class. Please try again with a valid URL. Note: Use of universal links in deeplinks is discouraged: triggering an universal link from the app implementing them will cause iOS to open safari. The action 'ACTION NAME' couldn't be found. Did you forget to register it? This can happen when you specified a custom action when creating the campaign on the dashboard, but the SDK couldn't execute it. Make sure you always register your actions at every app start.